Hacksaw, wood chisels, metal-framed saws. Heavy gauge nickel plated, tubular steel frame. Easy adjustment of frame for 10" and 12" blades. Blade can face in four different directions. Rugged cast handle with guard to protect knuckles. Includes a 10" carbon steel blade. 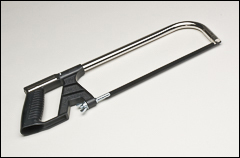 WARNING: Proposition 65 Label for hacksaw . shatterproof blades for hand hacksaws. Ideal combination of high hardness on cutting edge and tough alloy steel back with stretch resistance. Blades are packed 100/box but sold in any quantity. WARNING: Proposition 65 Label for bi-metal blades . 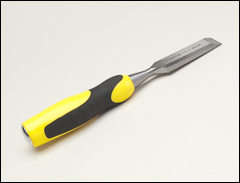 hacksaw blades for exceptionally smooth cuts on push and pull strokes. 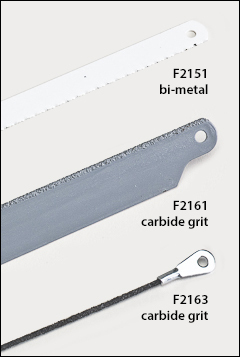 Fits standard hacksaw frames. Blades don't snag. Blade is forged from high quality tool steel. Fully heat treated, beveled, and polished. Large amber handle for a comfortable grip. Heavy-duty strike cap adds durability. Durable precision ground cutting edge. WARNING: Proposition 65 Label for chisels .